Toronto: McArthur & Co., c2007. A surprise read, this is one I didn't even know I had on my shelves -- but I noticed it this week while tidying and rearranging. And for some reason I picked it up and then read it straight through over one sunny afternoon. I really enjoyed it. Hines, who has also written The Spiral Garden, among other titles, is interested in theology and history. This book is a wonderfully human story of ancient history, interspersed with modern day chapters. Like the previous book I just reviewed, The Last Neanderthal, there is a conversation between the life of the past and those who study that past life in the present. In the past, Shahiroz is a young Jewish woman living in Babylon, training to be a priestess in the temple. Unfortunately for her, it's bad timing as Cyrus, a Persian king, has just conquered Babylon, and he "frees" (ie: exiles) all the Jewish captives who've now lived there for over 60 years. Shahiroz and her mother, a healer, leave with their families for the long trek back to Jerusalem where their welcome will be rather uncertain. But the joy and glory in this book is Hines' description of the metropolis of Babylon, and the daily role of the goddess in people's lives. Shahiroz' family worship both Yahweh and Asherah, and in Babylonian practice, the goddess is known as Ishtar or Isis or Inanna, and is an equal consort to the god who dies and is reborn in the yearly cycle of nature. It's when this equality is broken by Cyrus in his drive to establish a patriarchal society that the Jewish population is expelled. And it's in this journey back to Jerusalem that Shahiroz' father, a priest, decides that the best thing for Jerusalem is to develop a strong nation-state under a powerful theological story -- not surprisingly also an extreme patriarchal vision. 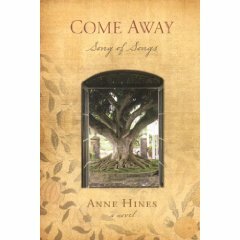 But The Question that Hines poses in this book -- namely, why the Song of Songs is included in the Bible in between two very sternly patriarchal books -- is not really answered by this development. The story posits that there was a goddess tradition that was suppressed and contained by this new movement for nation-state consistency. But why did this one book, supposedly reflecting that goddess tradition, remain? It's not clear. I was far more taken with the historical Babylon and wished to read more about it -- it sounded so beautiful and intriguing. I found that the book read quickly and past and present held together well. Hines' ideas were certainly intriguing to think about, and I could see how this book could lead to some very active discussion among readers. It was a serendipitous discovery and well worth spending the afternoon with. This book sounds fascinating, due to Hines' description of Babylon, and the role of the goddess in people's lives. Wonderful review, as always. Have a relaxing weekend. I really liked how she presented it. It seemed very grounded in everyday experiences. I love it when I come across a "new" book while tidying up. This one sounds good. I have a *lot* of books, but it's not often that I don't even know how one got onto the shelves... it was a nice surprise though!